A new poster for The Nun has scared its way online. For the second year in a row, Warner Bros. and New Line are bringing their upcoming slate of horror movies to San Diego Comic-Con for an event known as ScareDiego. The event takes place tonight and The Nun, which is the latest spin-off set within The Conjuring universe, is set to be a major part of the presentation. Ahead of the event, the studio has released this brand new poster for horror fans to feast their eyes upon. This new poster is quite a bit different than the one that was released ahead of the teaser trailer. 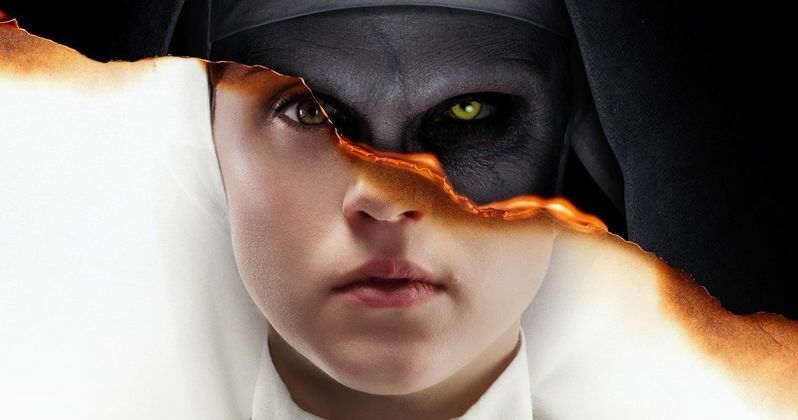 While the first poster focused exclusively on the demon nun known as Valak, this one features her a bit on top, but with a tearaway that reveals Taissa Farmiga's character Sister Irene on the bottom. The juxtaposition of the two images that are morphing together here paints a clear picture of good vs evil. Black vs white. Light vs dark. This new poster also proudly boasts the tagline, "Witness the darkest chapter in The Conjuring universe." That's no small claim, as there have been some dark entries in this horror movie universe previously. The Conjuring 2, where Valak made her terrifying debut, is certainly no slouch when it comes to its dark nature. Save for the first Annabelle, these movies have all been incredibly solid and crowd-pleasing. Even though they're being pretty bold in proclaiming the level of darkness we're going to witness this fall when The Nun arrives in theaters, one has to expect that this is going to be another very effective horror flick. James Wan, who directed The Conjuring and The Conjuring 2, is on board as a producer. Corin Hardy, known for his horror movie The Hallow and as the director of The Crow remake that never was and probably never will be, directs The Nun. The cast also includes Demian Bichir as Father Burke, Jonas Bloquet as local villager Frenchie, Charlotte Hope as Sister Victoria, Ingrid Bisu as Sister Oana, and Bonnie Aarons reprising her role as Valak. In addition to this spin-off, Annabelle 3, The Conjuring 3 and a spin-off centered on The Crooked Man are all also in the works. To date, the four movies in The Conjuring universe have grossed a combined $1.2 billion at the box office. It's expected that a new, full-length trailer for the movie will be shown tonight during the ScareDiego presentation. Whether or not that trailer is released online right away is up for debate. Though, with the release date set for September 7, just a couple of months away, it would certainly make sense to release the new trailer for The Nun online as well. While we wait for some new footage, be sure to check out the new poster, courtesy of The Nun's Twitter account, for yourself below.